Sneakers are great. We know how much you love yours. You get a sporty look while you play tennis and a comfy fit while you go for a run. But you know what? Pirates don’t wear sneakers and neither do superheroes. You also won’t see Robin Hood sporting a pair of sneakers either. If you plan on wearing a costume of any of those classic characters, then your feet are going to need to play their part in creating your new look too. That’s why you need a pair of boots. Yes, from swashbuckling scoundrels to heroic comic book characters, boots are the footwear of choice! 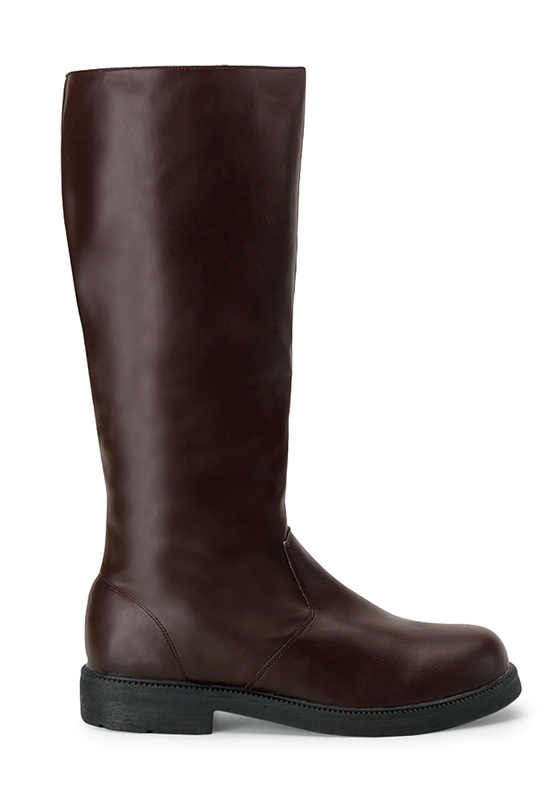 These brown costume boots help you attain a more authentic look with plenty of different costumes. They’re made of synthetic materials and fit with a zipper on the side. Just pair them up with any of our historical costumes or one of our superhero costumes to complete your style from head to toe. Medium Footbed length 11 1/2" 12"
Large Footbed length 12" 12"
X-Large Footbed length 12 1/2" 12"